Prius greener, but will it be meaner? 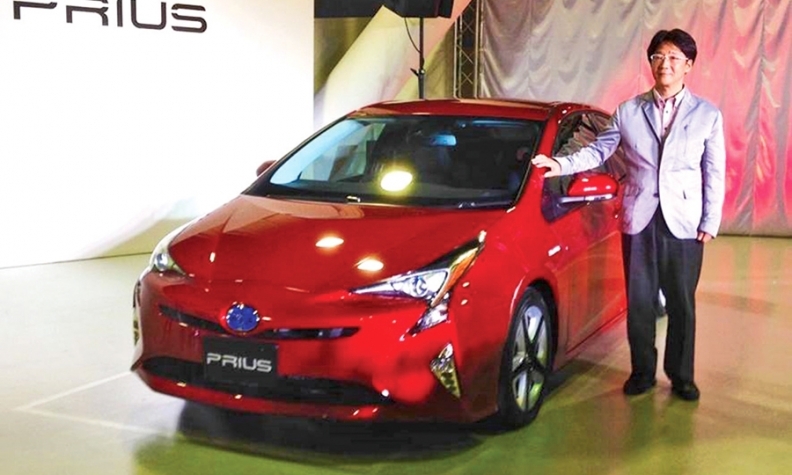 “We want it to have an edge,” says Prius chief engineer Koji Toyoshima. TOKYO -- Flashier styling? Check. Better fuel economy? Check. Toyota Motor Corp. popped the hood of its fourth-generation Prius last week, detailing a litany of impressive high-tech improvements to the flagship hybrid on everything from safety to comfort. Yet despite promising much livelier driving dynamics, the car's engineers steered clear of one key specification: horsepower. On paper at least, the fourth-generation Prius appears to lack the powertrain punch of the outgoing car, a vehicle hardly known for zippy acceleration. The re-engineered Atkinson-cycle, four-cylinder, 1.8-liter engine delivers a maximum output of 72 kilowatts, while a more compact electric motor delivers another 53 kw. That compares with about 73 kw. for the current engine and about 60 kw for the current motor. The combined net hybrid powertrain output of the third generation is 134 hp. The new Prius is also 22 pounds heavier, so it may not benefit from a better power to weight ratio. Koji Toyoshima, chief engineer for the next Prius, said the company would disclose total powertrain horsepower closer to the car's December launch in Japan. It arrives in the U.S. early next year. To be sure, raw horsepower is not the only measure of exhilarating driving. And software tweaks may give the combined hybrid output of the new engine and motor a higher total system horsepower than the third generation's. In the meantime, Toyota is touting the many innovations that promise a sportier drive, regardless of whether brute power actually is toned down. Toyota says the new body architecture is 60 percent more rigid, thanks to extensive use of high-tensile steel and a 30 percent increase in the number of laser spot welding points. The new design lowers the driver's hip point by 2.3 inches to go with the lower center of gravity, which makes for better handling. For better responsiveness, Toyota splurged on a double wishbone rear suspension, a more costly and sophisticated setup than the rear torsion beam in the outgoing Prius. In some markets, the new Prius will even get a four-wheel-drive option for the first time. Dubbed E-Four, the system will be powered by a high-output rear motor, which assists the engine and front motor to deliver power to both sets of wheels. Meanwhile, Toyoshima's team has reprogrammed the hybrid system software to improve the feel of acceleration. The goal: a smoother, more direct response in the low rpm range. The tweak also suppresses the initial upward nose pitch the current Prius experiences when the gas pedal is pushed. Engineers also have refined the regenerative braking that recharges the battery when the car slows. A new active hydraulic booster improves brake feel while reducing noise, Toyota said. Toyota says all those factors will move the needle to "sporty." Whatever the horsepower, Toyota's main mission with the next generation is much the same as it has always been: efficiency. Toyoshima's target was achieving fuel economy of 40 kilometers per liter under Japan's testing regimen. That equates to a 94 mpg and a 23 percent improvement over the current generation. But the Japanese figure does not convert directly into an EPA rating because the testing cycle is considered less stringent and demanding than the EPA's. Toyota did not give an EPA figure. But it promises the U.S. version will deliver a still-impressive 10 percent boost in EPA mpg. 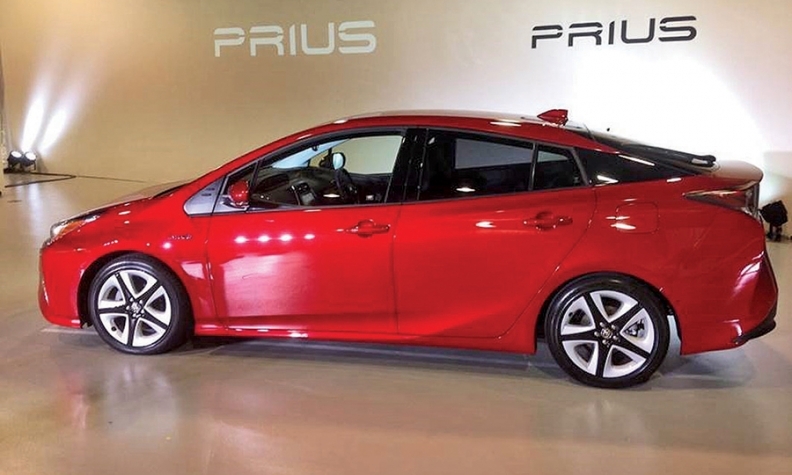 The 2015 Prius is rated at 51 mpg city, 48 mpg highway and 50 mpg combined. An Eco model of the next Prius is expected to achieve an even bigger improvement, Toyota said. Toyoshima's team enhanced every drivetrain component. For starters, the engine has thermal efficiency of 40 percent, a level Toyota calls the highest in any mass-produced gasoline engine. It tops the 38.5 percent in the current Prius. Higher efficiency means more energy from internal combustion is captured to power the wheels and less is lost through heat. With the redesigned motor and transaxle, Toyota said it achieved a 20 percent reduction in mechanical loss through friction. The outgoing version's planetary arrangement in the reduction gear has been replaced with parallel gears to further reduce loss. In addition, the hybrid system's power control unit is a third smaller and cuts loss by 20 percent. Even the batteries are smaller. "Our target was to ensure that there was significant improvement," Toyoshima said. "The competition is getting fierce now. ... We want it to have an edge."